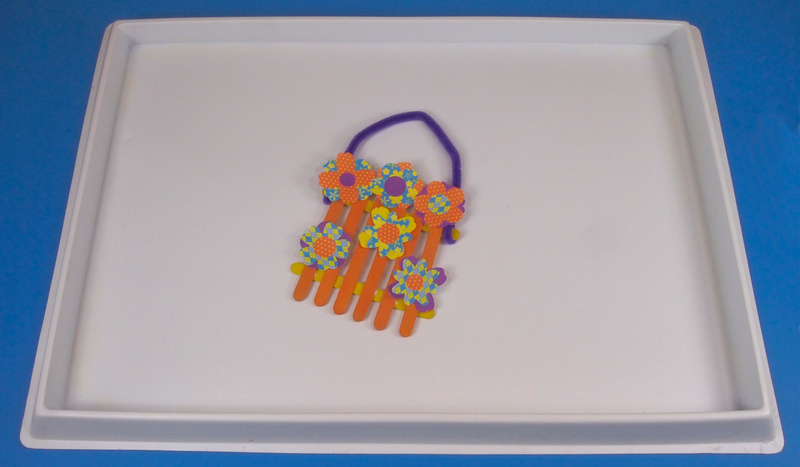 Decorative spring lattices will liven up any old doorknob! Remember to save your old Popsicle® sticks or grab a pack from the dollar store! Use our R15657 Wild Flower Paper Bits and a chenille stem to give this special seasonal doorhanger a lasting impression! Duration: 15-20 minutes including prep time. We’re going to start out this craft with the Popsicle® sticks. 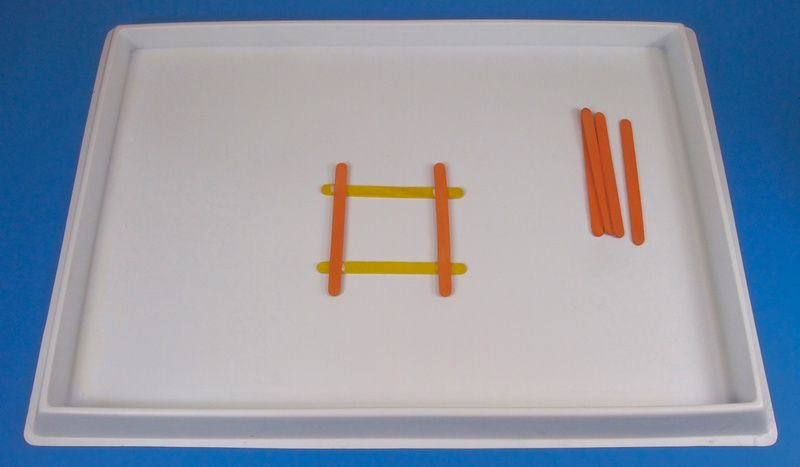 You’ll need 8 sticks; 2 for placing horizontally and 6 for placing vertically. Try to find different colors for the sticks that are placed differently. For the horizontal sticks I decided to make them yellow while the rest would be orange. 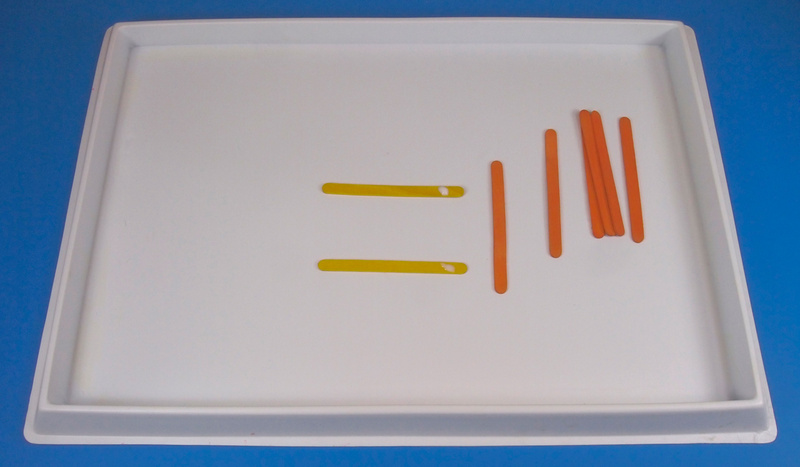 Here, I’ve set the two yellow sticks parallel to each other. They are running horizontally and are about 3″ apart. TIP: You can talk about these important mathematical terms to children as they are constructing the lattice. Ask children to give their own definitions about what makes something ‘parallel’, ‘horizontal’ and ‘vertical’ after they’ve placed their sticks in the appropriate direction. Place a bit of glue about half an inch below the ends of each stick. 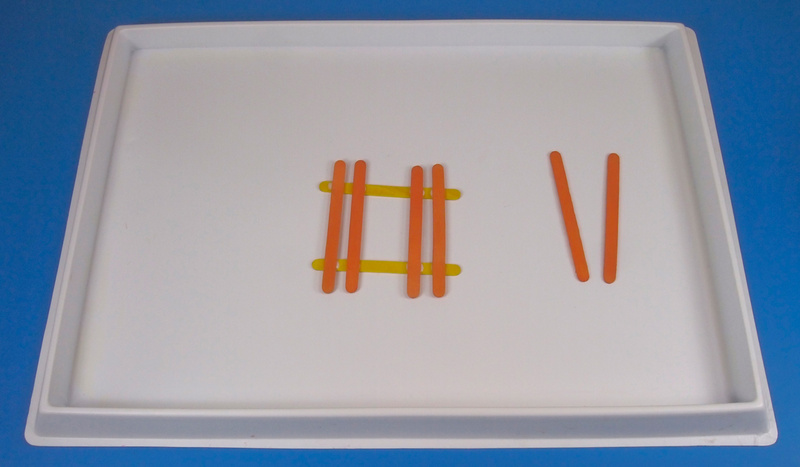 Place two sticks vertically across the horizontal sticks. Make sure they rest just on top of the glue. Press down to secure the glue, if needed. Add another couple of glue spots inwards beside the vertical sticks. 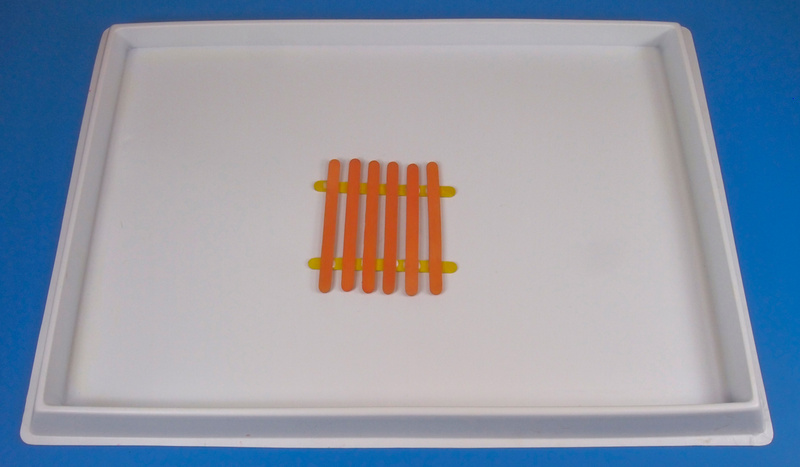 Place the next pair of vertical sticks across the horizontal sticks over top of the glue spots. Repeat this for the final pair of vertical sticks so you are left with something that looks like a miniature fence! Leave the lattice to dry while you make the flowers to decorate it! Use the R15657 Wild Flower Paper Bits to make the flowers. They’re super-easy to use! 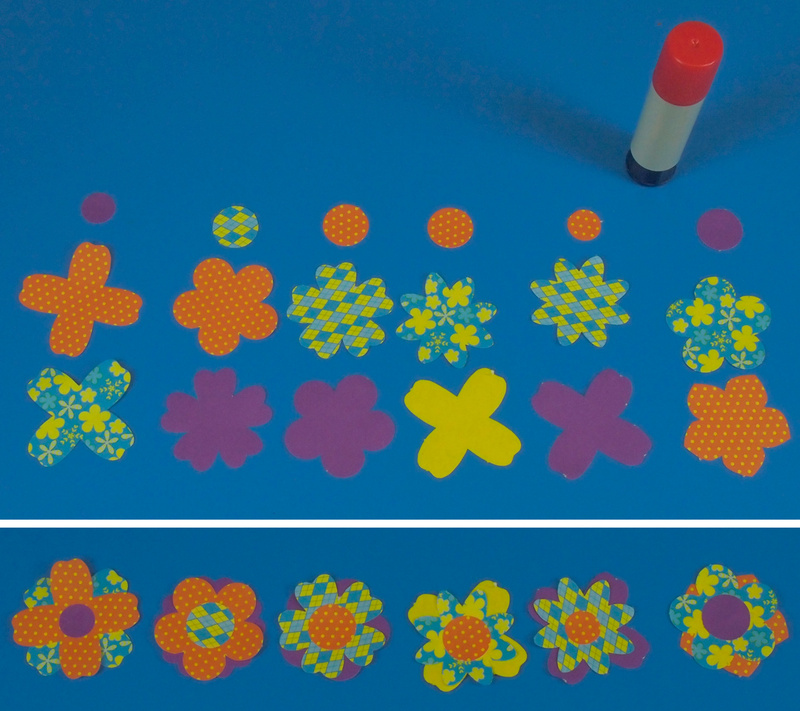 Just pop the pre-cut shapes out and layer them to form beautiful spring flowers. This is how I layered the various pieces that I popped out of the pack. You can make them according to the way I’ve put them together, or make your own variations. Basically, all you need is two contrasting colors and shapes of flowers and a circle for the center. Make sure that you layer the pieces so that the flower you put on the bottom is visible between the petals of the flower you place on top. Finish it off with the center and you’re good to go! You can make as many flowers as you think your lattice will hold but I decided to stick with 6 flowers in total. Here, I’ve taken the chenille stem and wrapped it around the end of the top vertical stick on one side. Repeat for the other side. 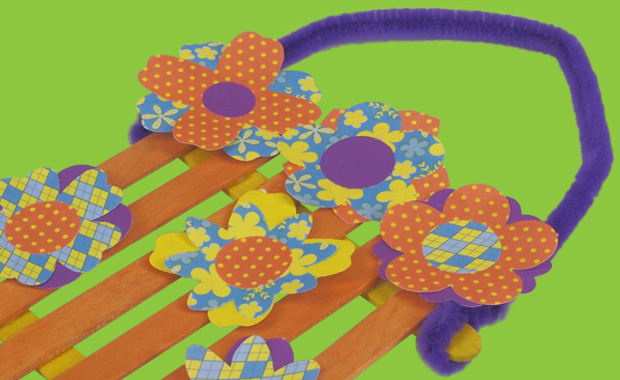 Now you can glue all the flowers onto the lattice. How cute is that! It makes me want to go outside and enjoy the beautiful spring weather! Thanks so much for checking out this art project! I’d love to see what kinds of designs your students or kids came up with for their spring lattices! Do you have a question or comment? Send us your photos or ideas through our contact form. Happy Spring! 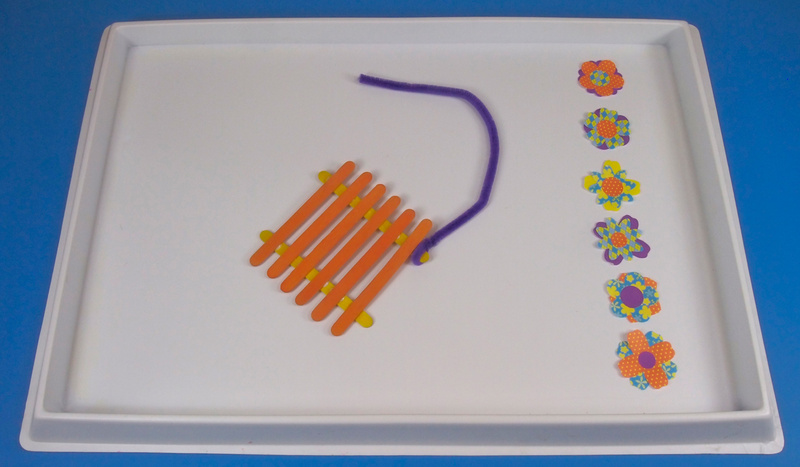 This entry was posted in Art, Crafts and tagged craft, decoration, decorative paper, lattice, popsicle stick craft, seasonal craft, spring, spring flower lattice by roylcoblog. Bookmark the permalink.